Myanmar opposition leader Aung San Suu Kyi (C) leaves the headquarters of the National League of Democracy (NLD) after she made a speech to a small crowd and the media in Yangon on Nov. 9, 2015. National League for Democracy claims 135 seats -nearly 90 percent - of results announced so far for lower house of parliament. Myanmar President Thein Sein has congratulated opposition leader Aung San Suu Kyi and her National League for Democracy Party (NLD) for their apparent landslide victory in this week's parliamentary elections over the military-backed Union Solidarity and Development Party (USDP). An NLD spokesman says the message the party received Wednesday from Information Minister U Ye Htut on behalf of Thein Sein included a promise that "the government will pursue a peaceful transfer" of power once the Union Election Commission has confirmed the NLD victory. The latest results from the country's Union Election Commission show the NLD has claimed 135 seats, or nearly 90 percent of the results announced so far for the lower house of parliament. Among the parliamentary winners is Aung San Suu Kyi herself, who won re-election to her seat in Kawhmu constituency in Yangon state. Myanmar's President Thein Sein (L) leaves after casting his vote in Naypyidaw on Nov. 8, 2015. Earlier Wednesday, U Ye Htut posted on his official Facebook page that President Thein Sein had accepted an offer from Aung San Suu Kyi to hold talks, but only after the election commission had completed the vote counting process. In addition to the president, the Nobel Peace laureate sent letters requesting talks to parliamentary speaker Shwe Mann and military chief Min Aung Hlaing in what she said was the spirit of "national reconciliation." Myanmar political experts say the NLD needs to capture two-thirds of the parliamentary seats to overcome the military’s veto in the bicameral legislature, known as the Pyidaungsu Hluttaw, which selects the president. The 70-year-old democracy icon is constitutionally barred from becoming president, because her late husband was British, as are her two children. But in an interview with the BBC Tuesday, she insisted that she will continue to make all decisions as NLD leader, regardless of who emerges as president. 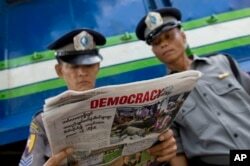 Police officers read a copy of the newspaper "Democracy Today" in Yangon, Myanmar, Wednesday, Nov. 11, 2015. The military automatically controls 25 percent of all parliamentary seats under the 2008 constitution, and maintains control of several key government posts, including defense, interior and border security. The military and the largest parties in the parliament will nominate candidates for president in February of next year. The top vote-getter will be president, while the two runners-up will be vice presidents. This was the first election in Myanmar, formally known as Burma, since the military junta established a quasi-civilian government in 2011, after nearly 50 years in power, and one year after Aung San Suu Kyi's two-decade long house detention ended and a ban on her NLD party was lifted. More than 30 million people cast votes in Sunday's election, which international observers mostly praised as successful, while raising concerns over the disenfranchisement of Muslims and other minorities and about the lack of transparency on the counting of advance ballots.